The thing about dancing, other than the part where I am bad at it, is that I love it. My favorite kind of dancing is the kind that people can't see me doing, and most often takes place in between my kitchen and our office. Lots of room. Clothing optional. Kidding!! Sorta. Don't get any ideas, I always close my blinds. I am not afraid to pump up the volume in my car to the right song, and my kids LOVE IT. Okay, not always. One time when I was driving down a street near my house I was PUMPED, and I was showing it, and I didn't care about any other drivers judging me because what do I care? I'm not going to see them again. Unless you are my neighbor, who was riding next to me in her Explorer. She honked, I looked over - BUSTED! I waved, and she commented later to me at the bus stop about my moves. I think she was a little bit jealous, and I can't blame her. With one hand on the wheel baby, I can BUST IT! Anyway, I have made a resolution of sorts that I am going to dance to one song every day. Better than anti-depressants, I say. Always on the lookout for more variety, I heard a song on the radio this morning that had my head bobbing and had I not been in the car, I would have launched into the Running Man. Serious. I wrote down enough of the lyrics so that I could look up the song when I got home, and not only did I find it on iTunes but they have the video on YouTube. And because I'm a giver, and I think you should dance more too, I've downloaded it for you here. It's like Ziggy Marley meets MC Hammer, and it's rad. Don't feel bad if you find yourself doing the Running Man in your living room while you listen, it happens to the best of us. Feel free to follow up all your comments about how you LOVE THIS SONG with other dance music suggestions. Now that I'm doing this every day, I need to expand my repertoire! 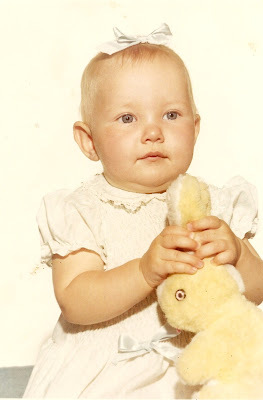 While rummaging through some photo albums earlier I found this picture of me as a baby. I have seen it a hundred times, but only recently with the element of foreshadowing that has been missing all these years. I mean, look at me. Me! With a RABBIT! It’s like I’ve known all my life that a rabbit would become a pivotal element of symbolism in my life. Do you think that little girl knows that she’s going to be so famous one day that seven people who aren’t even related will one day read her blog? Do you think she knows that she’s going to need therapy someday? Or that she looks horrible in green? And that she would despise eggs up until adulthood? Or that she would eventually eat mushrooms without throwing up? I wonder if she knows how hard it is to get a date. Probably, do you see how hard I’m clutching that rabbit’s ears, as if it represents all the future basketball stars who would reject me? (Andy Toolson, you know who you are.) I’d like to think I was dissing the photographer, like she’s back there making all these squealing noises, trying to get me to laugh or smile and I’m all, “Man, that chick is riDICulous.” Still. Me, the rabbit, it’s like it was meant to be. I haven't used my sewing machine since the Clinton years. I broke my streak this week as I ventured out to clothe my family room windows, in a feeble attempt to prove that I'm not completely domestically dead inside. Looks like the machine still works! I HAD EXTRA FRINGE, SO SAMANTHA SUGGESTED WE PIMP UP THE LAMPS. NOT BAD!